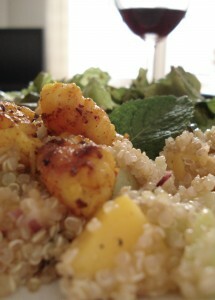 What do quinoa, mangoes and shrimp have in common? Not much; they just all found their way into my “Tantalizing Tabouli.” I’m a huge fan of tabouli, traditionally made with bulgur wheat and dominated by fresh parsley. I often play with different combinations of ingredients, including the grains. This version is a fun, colorful (and protein-packed) spin on the tabouli most of us know. How’d I get the idea? Recently, we discovered a new restaurant in Paris’ 15th arrondissement. C’est mon plaisir (8, rue Falguière, 75015) has a menu filled with many enticing entrées. Because I had to save room for the main course, I ended up opting for a simple salad with roquette lettuce, artichoke hearts and parmesan, but was tempted by a salad with, well, the three aforementioned ingredients. Since eyeing them on the menu, I couldn’t stop thinking about how I could put those ingredients together. I made my tabouli twice: once using cold, cooked shrimp and mixing them into the rest of the salad (everything was cold) and once sautéing them and placing hot shrimp over the cold salad- I vote for this last version. You can either keep the shrimp whole or cut them into smaller pieces. Quinoa is one of my preferred “grains.” I just referred to it as a grain, like most of us do, but it isn’t a grain at all. It’s a highly nutritional seed that comes from the plant Chenopodium quinoa, from the same family as spinach and beets! Quinoa is known for having been cultivated, and highly revered, by the Incas and its popularity has steadily been increasing here in France. It’s especially good for vegetarians, as it has a high protein content, and, for those who seek alternatives to wheat, the seeds are naturally gluten-free. In France you can find it relatively easily, either in natural food markets such as Naturalia or La Vie Claire or in the biologique (organic) or commerce equitable (fair trade) aisles of larger grocery stores. If sautéing the shrimp separately, add some spices. I used a few dashes of paprika and turmeric (curcuma in French). We ate our tabouli with roasted veggies (bell peppers, red onions…) and a green salad with balsamic vinegrette. What else might go well with it? This entry was posted in Recipes (All), Recipes (Gluten-free) and tagged fish, mains, restaurants, salads, vegetables. Bookmark the permalink.